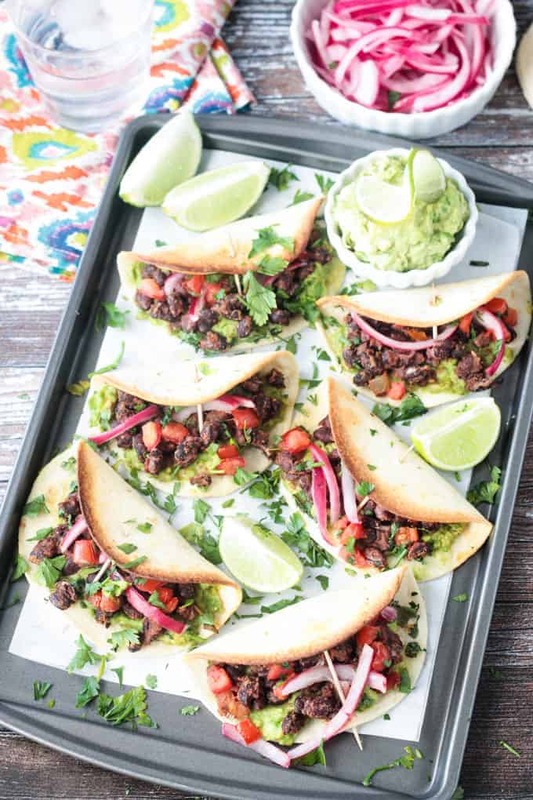 Crunchy Baked Black Bean Mini Tacos with creamy avocado, tangy pickled red onions, juicy diced tomatoes, and a sprinkle of fresh cilantro. Perfect for appetizers, party snacks, or dinner! 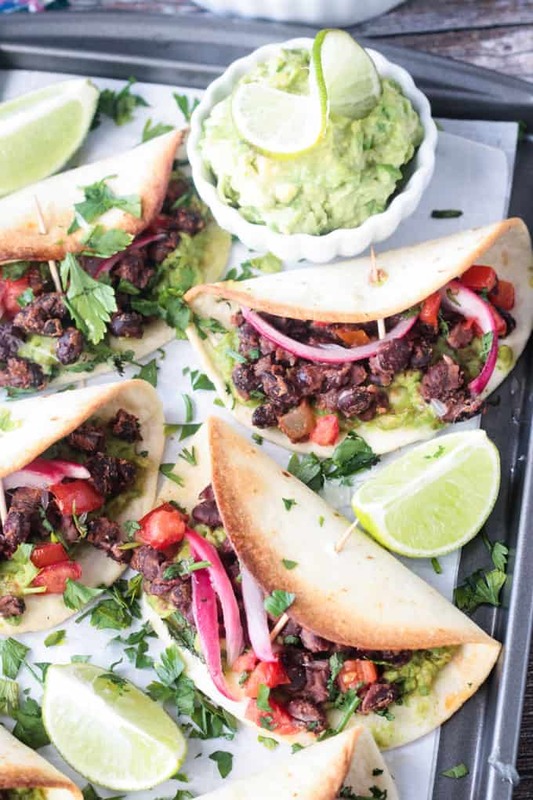 These crunchy vegetarian mini tacos are so easy to make! They’re ready in less than 30 minutes and need only a handful of ingredients, most of which you likely already have in your pantry. Easy to double or triple the recipe if you need to feed a crowd so invite your friends over for the big game and chow down! They’re small in size, but big on flavor. They’re easy to eat with one hand – the very definition of good party food. They’re kid friendly and adult approved. Why wouldn’t you want to make mini tacos? 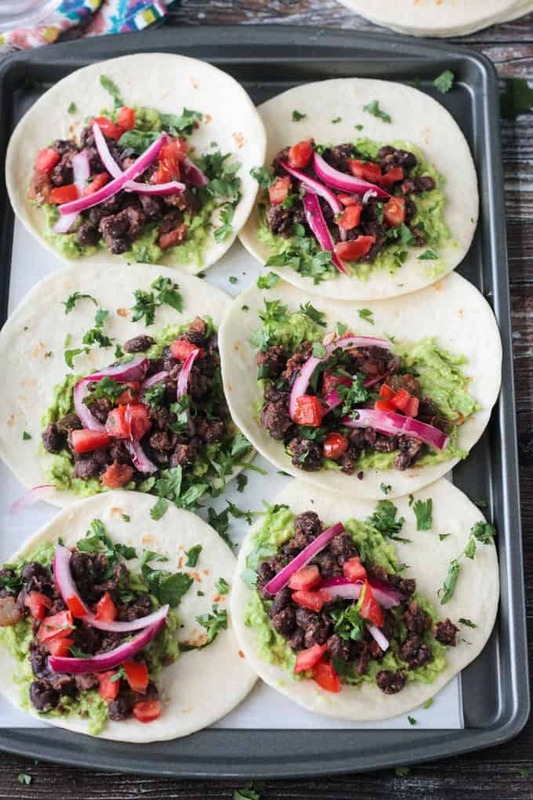 We love the combo of spiced black beans, creamy avocado, tangy pickled red onions, juicy diced tomatoes, and fresh chopped cilantro all wrapped up in a crunchy oven baked tortilla. 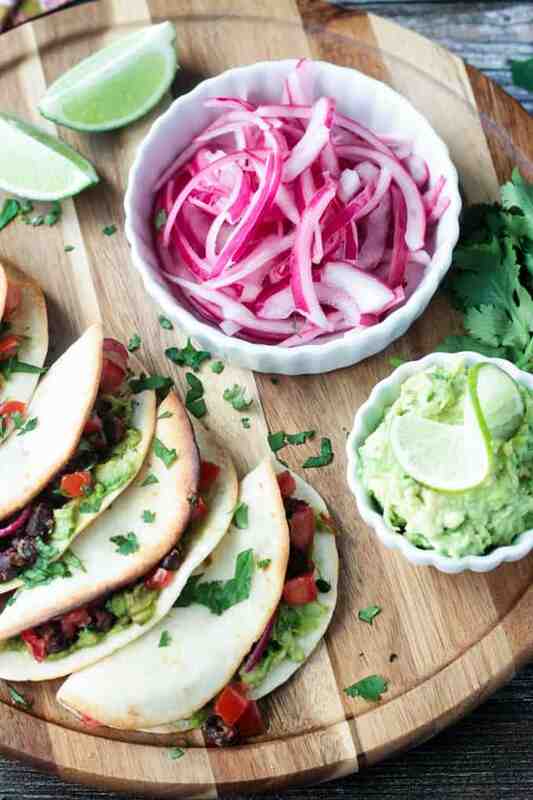 BUT, this baked tacos recipe could easily be customized with your favorite fillings. Swap the black beans for pinto beans. Swap the avocado for your favorite salsa. Swap the pickled red onions for thinly sliced radishes. Swap the diced tomato for fresh corn kernels. Or try lentils, sliced avocado, sautéed mushrooms, and diced peppers. Add diced red onion or pickled jalapeños for a spicy bite. Serve with the BEST Guacamole and/or a drizzle of Creamy Cumin Ranch Dressing to really send the flavors over the top! How would you fill your crunchy oven baked mini tacos? I hope you love these crunchy mini tacos as much as we do. If you try them, please come back and leave me a comment below with your feedback and star rating. Whisk together the white vinegar, water, sugar, and salt. Add the onion slices to a jar and pour the liquid over the top. Press the onions down so that they are all covered in the liquid. Cover the jar with a lid and set aside. Heat the oil in a small skillet over medium heat. Add the minced garlic and sauté 2-3 minutes until fragrant. Add the cumin, chili powder, and oregano, and sauté 1 minute. Add the black beans and salsa. Stir to combine and smash the beans a little with the back of a wooden spoon. Don't smash them all, you want some texture to remain. Cook, stirring frequently, for 5-6 minutes. Add a squeeze of lime juice and stir. Meanwhile, smash the avocados on a plate or in a bowl. Add a squeeze of lime and dash of salt, to taste, and stir to combine. Spread 1 tablespoon of avocado on a tortilla. Spoon 1-2 tablespoons of black beans on top of the avocado. Top with a few pickled red onions, chopped cilantro, and diced tomato. Fold the tortilla in half and secure with a toothpick. Place onto the prepared baking sheet. Repeat with the remaining ingredients. Bake for 10-12 minutes until crispy. Remove toothpicks. Enjoy! 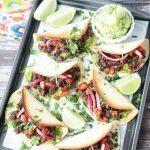 This recipe makes roughly 12 mini tacos, which will feed 4 as a meal or 6-8 as a party appetizer.